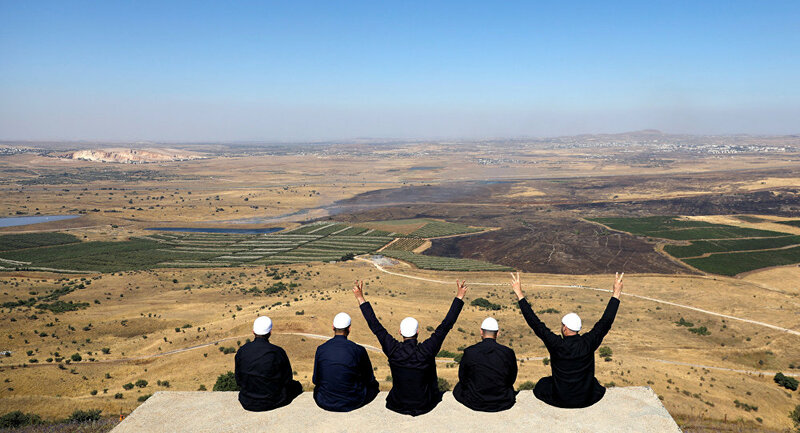 — Noa Landau נעה לנדאו (@noa_landau) 25 марта 2019 г.
Washington's move was made in spite of Arab League Secretary-General Aboul Gheit's last week announcement that the bloc fully supported Syrian sovereignty over the Golan Heights. This comes after last week Trump said in a statement that it was time for the United States to fully recognise Israel's sovereignty over the Golan Heights, overturning over 50 years of US policy toward the region, which supported UN Security Council Resolution 497 which unanimously recognised that the territory belonged to Syria. Trump's remarks were condemned by a number of countries, including Iran, Turkey, Syria and Russia. Prior to the US president's statement, US Senator Lindsey Graham told Israeli Prime Minister Benjamin Netanyahu that he would push the United States to formally recognise Israel's sovereignty over the Golan Heights, which were seized from Syria during the 1967 Six-Day War. The Golan Heights, considered by Syria and much of the international community to be a part of its territory, was occupied by Israel during the 1967 Six-Day War. It was not until 1981 that Tel Aviv passed legislation formally annexing the area. The United Nations has not recognised the annexation. Moreover, in 2018, the UN General Assembly adopted a resolution urging Israel to immediately withdraw its forces from the Golan Heights after the country organised local elections on 30 October. According to the statement issued by the government of Canada, the country "in accordance with international law...does not recognize permanent Israeli control over the Golan Heights." "Annexation of territory by force is prohibited under international law. Any declaration of a unilateral border change goes against the foundation of the rules-based international order," the statement reads. "Canada is a steadfast friend of Israel. We stand with Israel and support Israel's right to live in peace and security with its neighbours." The League of Arab states rejects US President Donald Trump's decision to recognise Israel's sovereignty over the Golan Heights, Arab League Secretary-General Ahmed Aboul Gheit said on Monday. "This US statement does not change anything in the status of the Golan Heights. The Golan is a piece of occupied Syrian territory ... Occupation is a serious crime, but attempts to legalize this occupation is also a great mistake," Aboul Gheit said in a statement. According to the Arab League secretary-general, "this decision is a violation of the international law ... that harms the US authority not only in the Middle Eastern region but also in the world." He added that Arab countries would unanimously recognise Syria's right to the Golan Heights at the organisation's upcoming summit. "It will definitely be reflected in the resolutions of the Arab League summit that will be held next week," Aboul Gheit stated. Earlier on Monday, Trump signed a proclamation formally recognising Israel's sovereignty over the Golan Heights. — CC (@ChatByCC) 25 марта 2019 г. — Alexander Nazaryan (@alexnazaryan) 25 марта 2019 г.
Israeli Prime Minister Benjamin Netanyahu, who is currently on a visit in the US, said on Monday that Washington's recognition of Israel's sovereignty over the Golan Heights is a historic day. The decision by US President Donald Trump to recognise Israel's sovereignty over the Golan Heights once again confirms that the United States does not respect international law, Turkish Foreign Minister Mevlut Cavusoglu said Monday. "The United States has once again shown that it does not respect international law. However, this decision does not in any way legalize the occupation by Israel [of the Golan Heights]," Cavusoglu wrote on Twitter. Syrian authorities on Monday called Trump's decision to recognise Israel's sovereignty over the Golan Heights an act of aggression against Syrian sovereignty and territorial integrity. Damascus also noted that Trump's move makes Washington 'the main enemy' of Arabs. First Deputy Chairman of the Federation Council Foreign Affairs Committee Vladimir Dzhabarov said on Monday that Moscow doesn't recognise Israel's sovereignty over the Golan Heights. On the same day, Russian Foreign Minister Sergei Lavrov told US Secretary of State Mike Pompeo on Monday over the telephone that the US' plan to recognise Israel's sovereignty over the Golan Heights would lead to a gross violation of international law, the Russian Foreign Ministry said in a statement. "It was also stressed that the US intention to recognise Israeli sovereignty over the Golan Heights would lead to a gross violation of international law, prevent the settlement of the Syrian crisis, and aggravate the situation in the Middle East," the statement said.